The famed novelist wrote the letter just two months after the publication of her landmark Civil Rights book. The letter will be auctioned at Nate D. Sanders Tuesday November 8, 2011 auction. The famed novelist wrote the letter just two months after the publication of her landmark Civil Rights book. The letter reads in part, You ask me where Maycomb County is, where the Landing isthe only answer I can give you is that Maycomb County is in my heart and the Landing is in my imagination. If, in To Kill a Mockingbird, I persuaded you that those places are real, that means I have succeeded in my profession, which is writing fiction. 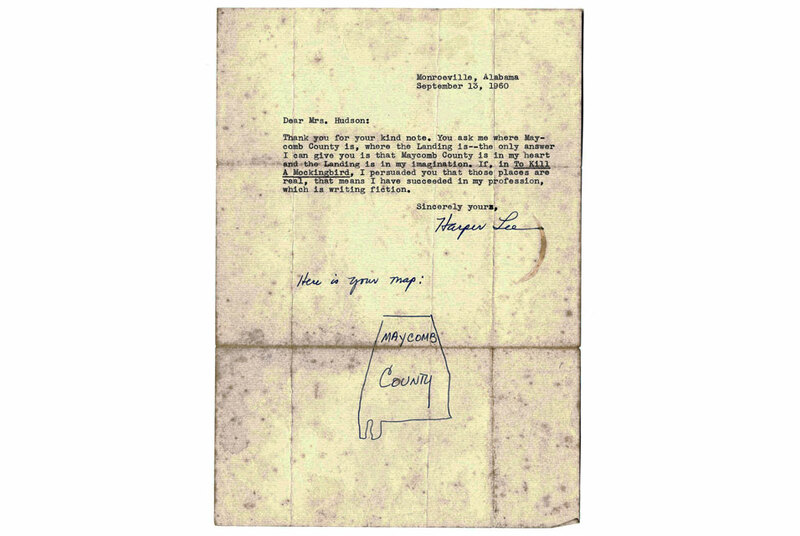 Lee inscribes at the bottom of the letter, Here is your map: and scribbles an outline of the state of Alabama with the words Maycomb County labeled in the northern/central part of the state. Nate D. Sanders is also auctioning a handwritten 1993 Lee letter in which she speaks highly about the potential of novelist Mark Childress. The 1960 letter is estimated to sell between $8,000-$10,000. The 1993 fan letter is estimated to go for between $5,000-$7,000. The auction ends Tuesday, November 8, 2011 at 5 pm Pacific Standard Time.